IT’S BACK! City-wide competition! 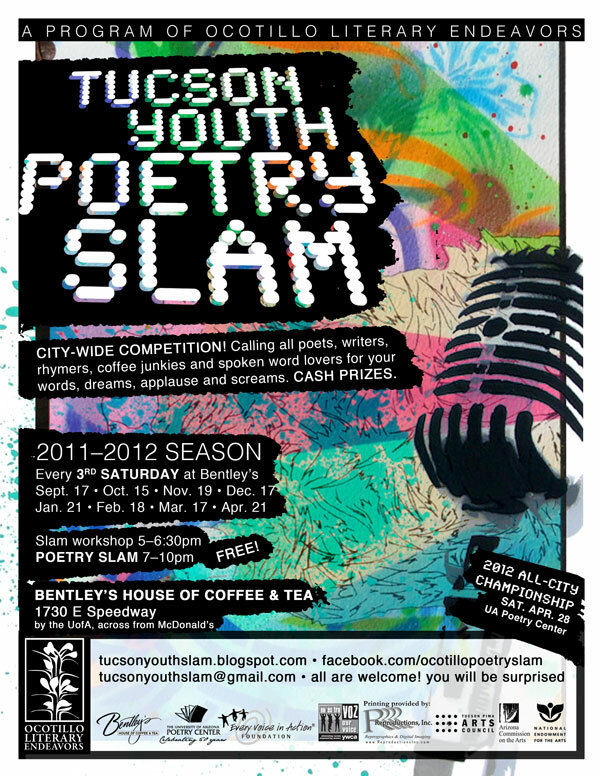 Calling all poets, writers, rhymers, coffee junkies and spoken word lovers for your words, dreams, applause and screams. Tucson’s hottest microphone open to all youth 18 & under. Cash prizes! Featuring slam champion CARLOS CONTRERAS, coming all the way from Albuquerque, NM just to be at the TYPS! Hosted by Logan Phillips & Sarita Gonzales! Led by Carlos Contreras of Albuquerque, NM! The Every Voice in Action Foundation, Bentley’s House of Coffee & Tea, UA Poetry Center, Tucson Pima Arts Council, YWCA Racial Justice Program / Nuestra Voz, the Arizona Commission on the Arts, and the National Endowment for the Arts. TYPS – ¡Summer slams 2011! Performance Workshop with James Kass of Brave New Voices!